The Icefields Parkway is a truly spectacular drive through 140 miles of amazing Canadian landscape. A drive that takes you north through the mountainous region of Banff National Park and into Jasper. During the winter the snow swept highway takes you up into the mountains and down to the lakes with views that will take your breath away. Travelling through in the winter we hardly saw a single person. There were huge car parks completely empty at every stop. This must be a very popular drive in the summer. When we stopped at the Athabasca Glacier we were completely alone as we took a short walk. There was one other car in the car park but no one in sight. In the windscreen was a note, ‘Be back Thursday’. That was four days away! As we looked up the majestic glacier and the clouds blew over we saw a person disappearing over the ridge. Visiting the glacier put things in perspective. I had always heard about climate change and how the planet was changing but, until this point, I had never really seen any physical proof. At the car park there was a sign that indicated where the glacier was in 1890. Then we walked past 1935 and 1990. It was jaw dropping how far the glacier had retreated. The rate at which the glacier moved forward was not enough to keep up with the speed at which it melted. It would have been a completely different trip in the summer, the roads covered in cars, people all over the place. 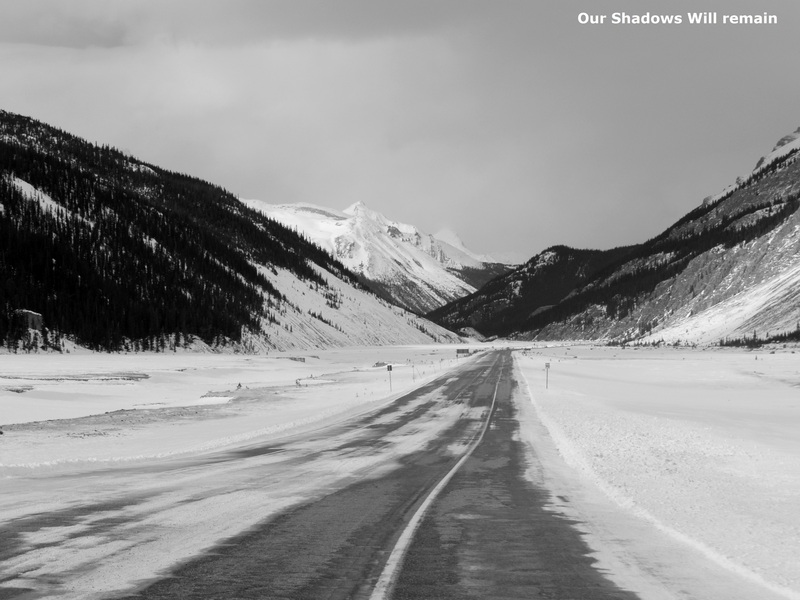 I enjoyed the drive in the winter, it created a beautiful and harsh landscape. The complete opposite of the summer. There was one thing, everything was covered in snow. At first it was beautiful but then I grew slightly tired of seeing frozen lakes covered in waist deep snow. it would have been nice to enjoy the beauty of summer and but still I wouldn’t have traded it in. To see what Banff National Park looks like in the summer why not take a look at the blog Rockies Outdoors. It sounds and looks amazing. It’s a huge country with plenty to see. Stop by again and hopefully I can show you other reasons to visit. I’m not missing these great posts!